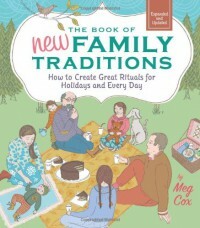 This book is basically a collection of briefly presented ideas for making memories & rituals out of both every-day and special occasions. I especially appreciated the ideas for memorializing a child's first day of school, giving a child both a new privilege and a new responsibility every birthday, and the section for traditions specific to adopted children. I also really like how easy to find event-related ideas are in this book. This one's been permanently added to our family bookshelf.